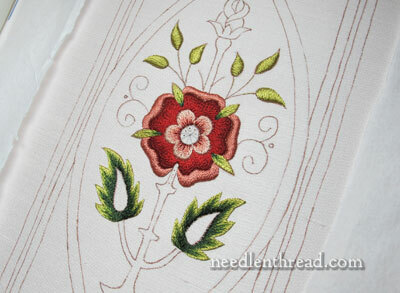 The satin stitch is complete on the outer parts of the petals on the Mission Rose. It dragged out a bit because I was avoiding the inevitable: I had to make a decision about the stem on the rose. It was a thread decision: To switch, or not to switch? Whether ’tis nobler in the mind to suffer the shortage of brown shades in one line of thread, or to take arms against the shortage, and by switching from one line of thread to another, end it? Will the rose look better with gold threads, or without them? Ahhhh…. anticipation! See, I’ve been musing that point. Is this piece of embroidery necessarily Destined for Metal Threads? At this point, I think it is. But it doesn’t have to be. And I might find, once I get to that point, that goldwork doesn’t really work with this piece. Initially, all the silk on the piece was going to be Soie de Paris. But the browns in that range are somewhat limited. I could have managed – I could have used just two colors of brown. After all, the piece is very stylized, and “flat” color is not unusual in such designs. I thought about working the lighter brown Soie de Paris for the whole stem, then going back and adding some sketchy strokes with dark brown, just to give it some shape and definition. But then the lazy side of me won out. 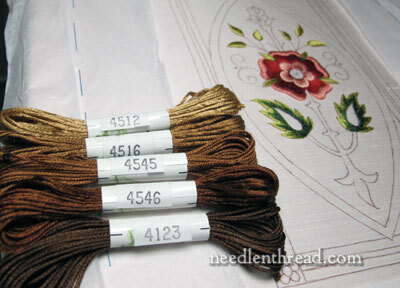 Soie d’Alger is easy to work with, the range of browns is extensive, and I wouldn’t have to guess my way through techniques, trying this approach or that approach to get the look I want. With Soie d’Alger, it’s just a matter of painting away with the shades in long and short stitch. No guess work. Just straightforward, everyday stitching. I guess we’ll know next week! Thoughts? Ideas? Reprimands? Coals to heap upon my head for making the thread switch? Anyone? Have your say below! If you’d like to read the backstory on the Mission Rose project, or catch up with the project from the starting point, check out the Mission Rose Project Index, where you’ll find all the articles relating to this project listed in chronological order. Changing colours is just creative license so go ahead and change. Since reading your blog and following along with other projects you have done, your changes are usually always improvements. I am looking forward to seeing what you decide. Please let us know as soon as you know what the substitutions will be so those threads can be ordered. Thank you again for sharing your creative talent with us. For a newbie to long and short stitch, it is amusing that you see stitching all in light brown with a few dark brown sketch stitches as more work then five shades in long and short stitch. No doubt your choice will be more realistic and dimensional. It just seems more laborious. I must say that the petals of the rose look wonderful and the padded satin stitch combined with the dark edge to the dark red petal are give it an amazing 3D look. I am a little disappointed that you changed the thread for the stem and are going to use various shades in long and short stitch. I feel it would have been truer to the liturgical original to have kept to the light brown with shaping stitches in darker. However, I look forward to seeing the stem finished and am prepared to have to change my opinion. Thank you for your work and instruction; maybe one day I will be up the standard where I am able to show something publically. I’ll keep on trying. You are truly the Shakespear of embroidery! :-). Well done! Mary, This is gorgeous, your artistry is always spectacular so, do what you think best. Lovely. Mary, I love your writing! How you managed to pull Hamlet out of your head and use it here was just delightful. (By the way, I didn’t know right off the bat that it was Hamlet…it was one of those “that sure sounds familiar” and “where did that come from?” things. I love Google and I love reading your blog. It’s one of the first things I do every morning whilst waking up with a cup of coffee. About the thread: my thought is why limit your creativity by forcing yourself to stick with one type of silk when there is another option that you know you’ll be happier with? Are you absolutely sure you want brown? I grow roses and the stems aren’t brown when the roses are blooming, only green with sometimes a hint of red near the bloom. I’m not a a big fan of brown on the best of days, but I really believe doing the stems in brown will muddy the look of the piece. I’ve been wondering if the gold is necessary, too. Maybe for those curlicues, but not on the actual rose or stem? What you’ve done so far is lovely and I know your final decision will be perfect. *Sigh* Oh, Nancy! I have troubled over this question a hundred and ten times! On the gold–what about making a fine twisted cord of silk and using that to outline the petals instead of gold? That’s a nice range of browns. Ha-Hah. No opinion on the thread color, but I enjoyed the literary reference. I think changing the thread type isn’t as big a change as the stitch you plan to use. You aren’t going for a serious reproduction of the original piece, but an interpretation of your own of it. So, which stitch/thread do you feel most strongly about? You have such a gift with your talent, I imagine either choice you make will look wonderful. Maybe you can try out the first idea on an inch or two, take a pic, then rip it out and do the same for the next idea, see which you like best. It’s all in shades of brown, so ripping it out won’t show. I just can’t wait to see how you work the center of the rose! I’d love to see you use the Soie d`Alger with it’s range of colors for shading. I love the two leaves at the base of the rose. Your expertise in shading makes the piece come alive for me. I only hope one day I’ll be able to “speak” with needle and thread as you are so eloquently able to do. Contrast usually helps a composition, so it may work just fine to switch. The rose has so much depth! The shading on the outer petals, created by the padding, is beautiful! Brown stems might focus your attention on the green triangle that will be formed by the top rose bud sepals and the two lower large green leaves, which will move your eye around in a circle until it comes to rest on the center rose. Or, it might visually busy up the piece. Or brown stems might make the green pop out more. Would a green stem do a better job of keeping your eyes moving in a circle around the piece? What do you want people to notice first? Your craftsmanship is so good, that it’s the first thing people will see, except that you make it look so easy, that it will be the last thing to be noticed. As it looks right now, my eyes follow the stem up to the center rose, then it begins a counter clockwise triangle between the bud, and then the two lower leaves, back up to the bud, and back down to the rose. And then I notice what beautiful stitching you’ve done. Take a picture of the piece as it is now, print out two color copies, and on one color in the stem with green and the other color in the one with brown and see what you think. I bet it changes how long your eye stays on the piece. Maybe you’ve already done that. The more I think about it, maybe the brown is the right choice. Does it make the leaves pop out more? Interesting. Well, it will be fun to see how this evolves. Thanks again for sharing your process. 🙂 Happy designing/stitching. The decisions we embroiders have to make, to switcheroo or not to switcheroo so say we end the heartache of the thousand natural shocks we embroiders are heir, to use brown thread of Soie de Paris or Soie d’Alger Ah there’s the rub………………. Whatever decisions you make Mary I’m sure the stem will look great. Love the rose with or without the gold. I am not a fan of brown rose stems. I think it makes the rose look dead; this after I had finished my stumpwork rose !! It may have been the fad back in the day but do we want to stay stuck in the past ? You’re delightful! Were you an english lit major? How’d you guess?! 🙂 It’s a curse, sometimes! When normal conversations turn into quotes – and especially quotes from Shakespeare – you know you have a problem! Mary, sometimes the easy way is also the best way. Better color range is good and less stress about trying to make the piece right with limited variety of color. Having to work harder never guarantees a superior outcome. Enjoy the process. That is as important as any tool. I too like your paraphrasing of Hamlet – it’s something that happens frequently around here. Shakespeare is so perfect for it. On the subject of the stems: while it is true that close to the flower, rose stems are green, down lower on the bush they are brown. However fwiw, here is my suggestion. Soie d’Alger comes in a lovely colour (sorry I can’t remember the number) in a dark greenbrown – I write it like that because I am damned if I can tell whether it is brown or green. And while we are on the subject, can you tell me what the difference between Soie d’Alger and Soie de Paris please? I like the former but am not at all averse to using something else, especially if it means shopping for more threads. As a lifelong stitcher/painter this is new to me since taking class from Agnes Davis in Florida Brazilian embroidery. She has made me addicted to this art. I do so appreciate and enjoy your sharing of your wonderful expertise. I look forward eagerly to receive your next post. I love the demention you were able to achieve in the rose and leaves. The stem in my mind wants to have some green in it. I know your decision will be just right. Thank you again for helping me along on my new learning experience. Mary: Since Soie d’Alger is a spun silk and has less sheen than Soie de Paris, a filament silk, will there be a noticeable difference in the sheen-ness of the stem versus the rest of the piece? (I had to go back to your earlier post to see what the difference between d’Alger and de Paris was!) If there is, is that a good thing? I.e., perhaps making the stem recess through lower sheen-essity, making the flower more prominent? As for the question of to add or not to add the gold: I say yes. While the piece will be beautiful without it, I believe adding the gold will increase the wow-factor. It will also make the piece look like stained glass, with the gold acting as the leading between pieces of glass. You have chosen well in changing the threads. Not just because it allows for additional shading, but I think the subtle change in texture and shine will work really well. I am not sure how you are planning to work the shading for the stems – have you thought of working them in stem stitch instead? I can imagine it would look great with the shading from dark to light across the width. As for gold or not… perhaps not ‘all over the place’ but it could really make the centre rose pop. Merci pour tant de beauté .Je viens de découvrir ce site!! !Je brode depuis 3 ans !! !et je vais m’ améliorer ici ! !quelle chance .merci encore . une petite vidéo pour expliquer le passé empiettant peut etre???? Next Next post: Online Crazy Quilting Class with Allie!